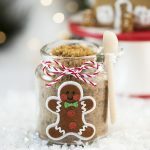 DIY Gingerbread Sugar Scrub – this easy gingerbread sugar scrub is made with only 3 ingredients, smells amazing and makes a lovely handmade gift idea! Mix all ingredients in a small bowl until well combined. Store in airtight container.